(CNN) -- Israel's Andy Ram will be able to play in the Dubai Tennis Championships next week after being granted a visa to enter the United Arab Emirates. Israeli doubles specialist Ram has been granted access to next week's Dubai tournament. The ATP had been under pressure to ensure Ram could compete after his countrywoman Shahar Peer was prevented from playing in the women's event this week. ATP president and executive chairman Adam Helfant told PA Sport: "I am pleased that the efforts to secure Andy Ram's visa to compete in the ATP World Tour 500 event in Dubai next week have been successful. "The United Arab Emirates government has made the right decision in allowing Andy Ram to enter their country and compete in next week's Dubai Tennis Championships. "No player who qualifies to play an ATP World Tour event should be denied their right to compete on the basis of ethnicity, nationality or religion and we are happy that the Dubai Tennis Championships and the UAE have shown that they share that view." 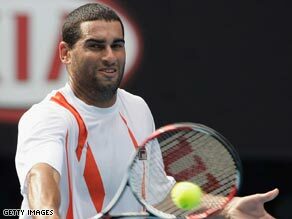 Ram, 28, is one of the leading doubles players on the ATP Tour and won the Australian Open title last year. Peer, the world number 45, described the decision to turn down her visa request as an "injustice" and hit out at the "politics" and "discrimination" of the situation. WTA chairman and chief executive officer Larry Scott echoed her stance, calling the decision "reprehensible and unacceptable", but believes the decision means the same thing will not happen again. The tournament's future had been in doubt following the incident and Scott confirmed penalties are still to be decided. He said: "We welcome the change of the UAE policy, which will allow Andy Ram to play this week in Dubai and which clarifies that all Israeli athletes will be able to compete in future tournaments in UAE. "Shahar Peer is owed all of our thanks for her courage in challenging an unjust policy and for forcing action to be taken that resulted in today's announcement. "We thank all of the many organisations and individuals that rallied behind Shahar and pressed the UAE to change their discriminatory stance. It is deeply regrettable that Shahar had to suffer the negative consequences of the UAE decision this past week in order for this policy to get turned around for the benefit of others. "What happened to Shahar last week was discriminatory, reprehensible and unacceptable, and the Tour will shortly be determining remedies for her, penalties to be imposed on the tournament, and the additional assurances we will require to guarantee all Israeli athletes entry to the UAE so that future tournaments in the UAE may take place." Although Ram's participation in Dubai next week is now assured, one player who will not attend the tournament is world number one Rafael Nadal. The Spaniard has opted to pulled out of the event to rest the knee ligament injury he sustainted in Sunday's Rotterdam defeat to Andy Murray. The 22-year-old has also taken the decision to ensure he will be fit Nadal for Spain's Davis Cup World Group match against Serbia in Benidorm next month.